The world is yours to explore. Come relax, rejuvenate and embrace mother nature in Franklin, NC. Hike the stunning mountain trails, see gorgeous waterfalls, go picnicking in the beautiful parks, go tubing down the rivers or stop and fish along the way. Digging for gems is a must on your “to do” list! After a fun-filled day, return to the cabin and relax on the deck with your favorite beverage while enjoying the wealth of nature’s natural beauty. The cabin has everything you need to make your stay feel like you’re right at home with dishes, pots & pans, fresh linens, clean towels and extra blankets. The cabin is stocked with games, puzzles and TV/DVD with a small selection of movies. The bedroom has a new king size mattress. The couch in the living room opens up to a full-sized bed that comfortably sleeps two. You are welcome to use 5 acres of the property. Enjoy a walk around the pond and feed the fish or follow the creek down to the pasture. There is a fire pit near the pond. You can enjoy a camp fire and make s’mores. We have plenty of firewood stack under the pavilion by the pond. Peace and tranquility awaits you. Laundry detergent, fabric softener and bleach provided in the laundry room. Feel free to use anything left in the refrigerator. There is a regular coffee maker with filters, coffee and creamer. We have a Keurig coffee machine with a variety of pods and also an espresso machine. There is a toaster and a toaster oven. Feel free to use anything in the pantry. There is a foldup table that seats 4 in the dining room. If you need additional seating, there is another foldup table with 4 chairs inside next to the refrigerator. There is a large flat screen TV in the living room with a fire stick (no cable). We also have a smaller flat screen TV in the bedroom with a built-in DVD player. The small flat screen TV in the bedroom has a built-in DVD player. There is an assortment of books in the living room and bedroom for your reading pleasure. There is a small selection of board games for your entertainment: chess, Monopoly, UNO, puzzles and more. There is a small selection of DVD (family movies) in the top right drawer. 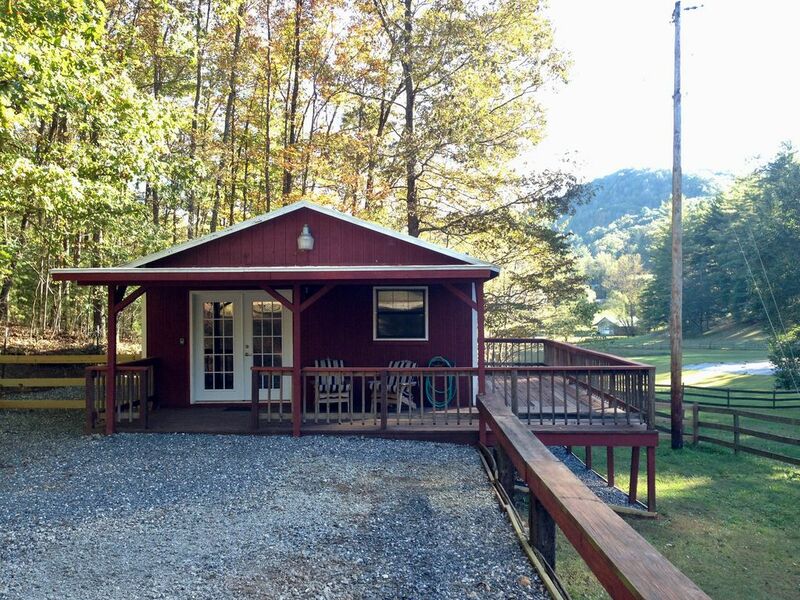 Enjoy 5 acres of property with a fire pit near the pond and plenty of firewood stacked in the pavilion. You can feed the fish, enjoy a walk around the pond or follow the creek to the pasture. Have a seat and enjoy the fresh mountain air on the 2 adirondack chairs in front of the cabin. For additional seating, there are 4 patio chairs stacked up to the side of the cabin. We thoroughly enjoyed our time at Carl & Vivian cute little cottage. It was very clean and comfortable. Vivian has thought of everything, from fresh farm eggs, coffee, spices, condiments, kitchen necessities, and toiletries. Plenty of bath towels, blankets, pillows, and she even has laundry detergent and dryer sheets, if needed. The mattress is one of the best we slept on! The cottage is situated on their small farm and the atmosphere is beautiful and quiet. Very peaceful. We are sure others will enjoy this little gem as much as we did! This cabin was very comfortable with lots of nice little touches. The bed was excellent. Good shower. I do recommend arriving before dark since it's a bit remote. The eggs were a treat! What a great cabin with the right amount isolation. Close to a lot of great hikes, waterfalls, and breweries. Carl and Vivian were wonderful hosts and even gave us farm fresh eggs. Cabin has the essentials in the kitchen and all around the cabin. Would definitely recommend friends and family on staying here. Thank you for recommending us to your friends and for the great review. It's great to hear you enjoyed the farm fresh eggs and your stay at the cabin. We look forward to hosting you again in the future! Fantastic-Carl and Vivian's motto-Time spent in nature heals the body and soul-is 100% right. This was my third trip to Sunny Lane and it was just as great as the first. The cabin is always spotless and well-stocked. One of the things I've noticed too is that everything in the cabin looks as fresh and nice as the first time I came. Many times when you go back to a cabin it's got a "used" look, but not here. If you need a place to relax and unwind, this is it. There are plenty of places to go shopping, hiking,or waterfall viewing nearby or stay here and roam the property and enjoy the sounds of nature. Thank you Carl and Vivian for sharing this beautiful place. The cabin is very cute, extremely clean and has everything you could possibly need during your stay. The kitchen was well stocked with all of the essentials. Had a wonderful time, and would definitely consider renting this again. Thank you Lynn for reviewing us. We are glad you and Randy enjoyed your stay at the cabin and look forward to hosting you again in the future! Very nice and clean. Very quiet. Was everything we were looking for. Thank you for reviewing us. We are glad you enjoyed your stay.